Congratulations! You have found south florida's #1 resource for Money Machine rentals. We do not sell Money Machines, we rent our Money Machines for private parties, trade shows, carnivals, casino parties, bar mitzvahs, and corporate events. We do not work from a rolodex like some of our competitors, we own our equipment! We serves all of Dade, Broward, and Palm Beach County. We want to help educate you so you make the correct choice in choosing the right Money Machine for your next florida party. Inflatable Money Machines take up the most space and usually have an external blower so they can be noisy. They are easy to transport b/c they can be folded up to fit in an SUV or even a large car trunk. They are easy to set up b/c you unfold the unit, attach the air blower, plug it in and turn on the power. The power of these blowers is dependent on the type of blower you are using. Ex. 1/2 horsepower blower vs. 1 hp blower. Also remember that part of the blower is being used to inflate the Money Machine itself. Inflatable Money Machines are fairly stable, but b/c there is no solid frame they can fall over if a guest trips and falls against the inside wall, so if it is an event with alcohol being served an Inflatable Money Machine may not be the best choice. There is also the unlikely chance that if the inflatable is ripped that the unit will not function properly b/c of the tear and the air escaping. 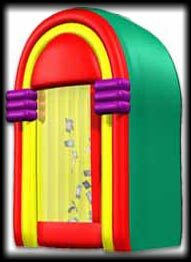 There are many attractive Inflatable Money Machine designs such as giant safes, vaults, slot machines, juke boxes, and cubes. Inflatable Money Machines are cheaper to rent then hard case Money Machines b/c they are easier to transport and are less expensive to buy. Soft case Money Machines take up less space then inflatable Money Machines, but they also have an external blower so they're equally loud. They have a frame consisting of metal poles that offers some stability, but the case can still fall over since the poles are light weight. These cases can rip b/c the shell is made with clear vinyl or plastic, but a rip will not cause the unit to deflate like an inflatable Money Machine. Soft case Money Machines are the easiest to transport, but take longer to set up then an inflatable b/c the frame has to be assembled and disassembled for every event. There are many attractive designs for these soft case Money Machines and they are usually the cheapest to rent if you have a kids party with a small budget, and not a lot of space for set up. Hard case Money Machines are considered the premium Money Machines. They are considerably more expensive to purchase than an infltable or soft case Money Machine b/c they are designed with a solid metal frame that is durable and heavy so they cannot tip over. The sides are usually made with polycarbonate (lexan) or a thick acrylic so there are no parts that can tear or bend. The blower is typically an industrial strength blower that makes less noise b/c it is built inside the unit. Some of these hard case units have wheels for easy transport, built in electronics and lights for special effects like changing color, automatic count down timers that shut the unit on/off automatically, and a built in message display for personalizing a message or brand. These units are the quickest to set up, just wheel it in and plug it in. Hard case Money Machines take up very little space like the soft case Money Machines. They can be the most expensive to rent. Hard case Money Machines are considered the nicest of the Money Machines and are the most professional looking. Feel what it's like to be on a game show or in Las Vegas by testing your money grabbing skills. Test your reflexes and see if you can you grab more cash out of the air than your friends. Realistic lights and countdown timer make this the most realistic Money Machine experience you will ever encounter. We use the same hi-end Money Machines used on game shows in Las Vegas! Why Pick Our Hard Case Money Machine? Our Money Machine has a steel frame design with polished diamond plate metal trim for a beautiful and professional look. It has clear, polycarbonate walls on all 4 sides, unlike most Money Machines which only have 3 clear sides and a mirror on the fourth side. Most inflatable money machines are not as stable and have either a weak metal frame or no metal frame so if someone gets excited and trips then the whole money machine falls over with them inside resulting in potential injury! Our Money Machines blow the funny money around very quickly with a powerful industrial blower that is reliable and quiet. Weak blowers create dead zones and barely keep the money moving which reduces the fun and excitement by making it too easy! Our blowers create a powerful, realistic effect b/c we use the same Money Machines used on TV Game Shows! 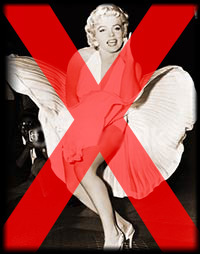 Our Money Machines were specially designed to blow air horizontally out of the bottom so women don't have to worry about their dresses blowing upward like Marilyn Monroe. Our Money Machine is filled with 300 realistic funny money dollars so there is plenty of cash to grab. Coupons or real cash can also be used! Our Money Machine has internal color changing L.E.D. lights that can be programmed to match any color or automatically change colors, blink, strobe, and chase in different patterns. Our Money Machine also has a full color customized L.E.D message display that can be programmed to scroll your personalized message. Our Money Machine can be programed to give guests anywhere from 5 to 60 seconds of time to grab the cash. We can provide prizes for your guests as well. Our Money Machine is built with safety in mind. Our trained attendant will provide 2 pairs of safety goggles and our Money Machine will automatically shut off if the door is accidentally opened during use. The fan and all electronic parts are inaccessible from inside the Money Machine. 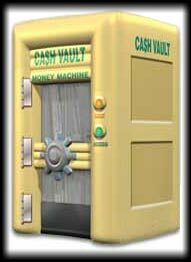 If no one is using the Money Machine it can be programmed to automatically turn on and blow the cash around to attract guests. The attract mode time can be adjusted. 8. THE HOTTEST Money Machine ANYWHERE! We didn't just buy any Money Machine. 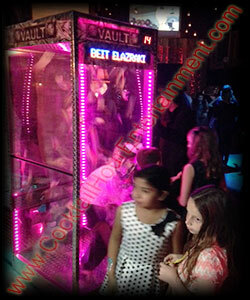 We put a lot of time and effort into finding the best Money Machine for your event! We looked at every model in the industry and had the most professional, customizable model in the industry made for us b/c every one of your guests is a potential customer and we want to amaze them! Here is our Cash Cube used in Katy Perry's Music Video, "Waking Up in Vegas." WHO USES OUR Money MachineS? Rent our Money Machines for business promotions, event marketing, trade shows, casino events, grand openings, and parties. Our Money Machines entertain crowds and attracts perspective clients to your business for a chance to grab at hundreds of dollars in cash, funny money, or customized coupons that can be used toward purchasing your products or services. Crowds and Media are Drawn to our Money Machines! The presence of a Money Machine at your trade show booth or event marketing promotion acts as an incredible people magnet. Crowds and media can't resist the sights and sounds of swirling money or prize vouchers swirling around inside the Money Machine. If your goal is to grab attention and win over customers, our Money Machine is the ideal event marketing tool! Our Money Machines can be used to blow cash, paper money, vouchers, certificates or any paper product that fits into your event marketing strategy. Best of all, you have control over how much players can win in the Money Machine. Winnings are controlled by time in machine, denomination of cash, and amount of cash in the Money Machine. 1. Rounds are usually set for 15-30 seconds to allow contestants to grab as much money from the air as possible before time expires. 2. Enter Money Machine, PUT ON GOGGLES, contestants must stand upright and cannot bend at the waist or knees to pick up cash from the floor. Contestants can use their feet to "kick up" cash that may accumulate in the bottom corners to blow up toward them. 3. Cash must be grabbed from the air, you cannot use your clothing to grab the cash or grab it from the ceiling when time expires. 5. 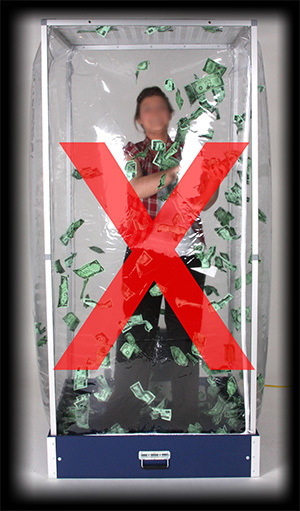 Contestant will be directed to exit the Money Machine after time expires, then remove goggles. 6. Contestant can be awarded a prize if they grab more than a predetermined amount of funny money. Contestant must be in good physical condition to participate. Persons with back, neck, knee or joint injury, respiratory problems or who may be pregnant should not participate. If you are currently under medical care, please consult your physician before participating in this event. Our Money Machine Cash Cubes blow real cash, paper money, or coupons around players who try catching as much as possible in a certain allowed time. 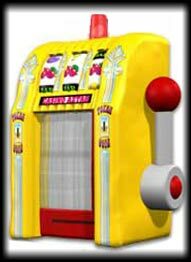 Our casino grade Money Machines are available for your party in many styles and price levels and are perfect for promotion of companies and organizations or for renting to others for big profits. The New Grabber is an inexpensive Money Machine that is ideal for smaller locations on a budget. Players remain outside of the machine while reaching inside to grab all the cash and paper prizes they can. The Grabber machine takes up less space and is only half the price of a full size Money Machine. Each has a powder coated steel cabinet with scratch resistant polycarbonate and a 125 bill capacity. Dimensions 26"W x 26"D x 72"H. 135 pounds. Table top cash cube Money Machine for sale. Our table top Money Machines allow players the playing sensation of a full size cash cube in a inexpensive and smaller sized machine. These small Money Machines can sit on a table or counter and are quality constructed out of steel and lexan that makes for a hard body cash cube booth that will last for years to come. 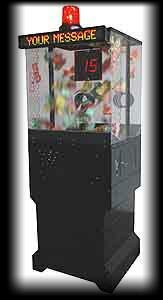 The Grabber and One Armed Bandit table top Money Machines are perfect for promoting any business or organization. Dimensions 26W x 26D x 40"H. 90 pounds. The One Armed Bandit table top Money Machine is economical and is easy to store, move and setup. The One Armed Bandit has a 100 bill/note capacity and contestants grab cash or what have you with one arm for normally 10 seconds. 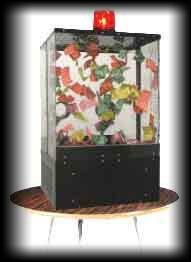 Time is adjustable and the bandit cash cube cabinet features a durable powder coated steel and lexan construction. Great economical mini cash cube for business promotions and school fairs. Suggested Placement: Casinos, Night Clubs, TV/Radio Stations, Auto Dealers, Grand Openings, Business Promotions, Charities, Private Parties, Corporate Picnics, Malls, Bingo Halls, School and Church Groups, Fund Raising Events. Dimensions: 16" X 16" x 40" minus beacon. Inflatable Money Machines are great for business promotions! Inflatable Money Machines are an inexpensive way to attract business if you want the fun and excitement of a Money Machine at your upcoming promotion. These Money Machines are easy to transport, setup and store when not in use. 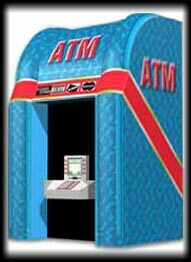 Available in several themes that will fit into any business or environment, these money machines are made out of heavy duty materials for long life. Each Money Machine allows players the opportunity to catch real money, funny money, or coupons as they are blown around inside the inner chamber by a secondary air-circulation system! All Money Machines feature high-quality, digitally-printed accents and are conveniently portable, weighing apx 60 lbs. and they set up in minutes. Dimensions are 10'H x 7'W x 5'L, Weight 61 pounds.